The college baseball season is still young, and we already have our first no-hitter as Elon veteran righthander Robbie Welhaf did the honors in a dominant 7-0 win over Longwood. 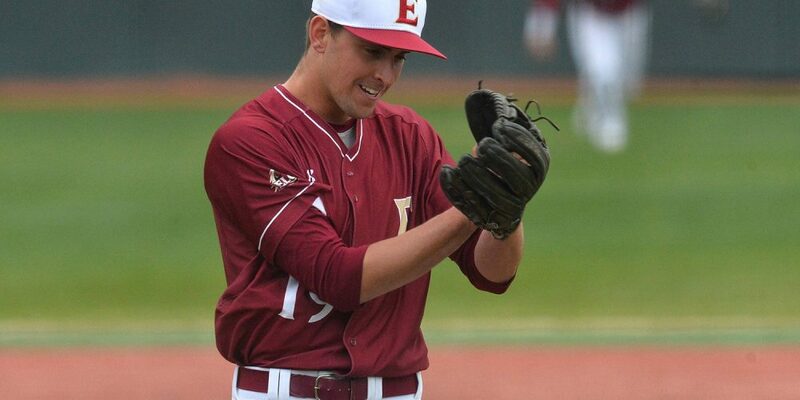 Before Saturday, no pitcher in the history of Elon’s program had thrown a no-hitter. That is no longer the case, as Welhaf would’ve recorded a perfect game if not for a lone walk to the second hitter in the second inning. Though Welhaf didn’t get the perfect game, he truly had an afternoon to remember for the Phoenix. He struck out eight and walked one in the complete game performance, while also accomplishing the feat with just 100 pitches and good overall stuff. Does it get any better than celebrating a NO HITTER with your squad? Congrats, Robbie Welhaf! Welhaf’s performance against the Lancers could very well propel him to a quality junior campaign. The righty welcomes his more important role this spring. Last season, he appeared in just 16 games, made one start and struck out 12 batters. Welhaf is the man of the hour and the Phoenix are now 2-0 for the season. Elon can’t ask for much more than that at this juncture. It’s well documented that Albuquerque is home to one of the more offensive-friendly environments in college baseball. You know what, though? It’s still a blast to see some of the offensive numbers that pour into the box scores, especially in times like Saturday night with New Mexico first baseman Jack Zoellner. Zoellner had an afternoon to remember as the Lobos improved to 2-0 with a 10-4 victory over Binghamton. The 6-foot-2, 205-pound, senior went 3-for-4 with three homers, three runs scored and a whopping six RBIs. Zoellner’s first home run came way of a three-run shot in the third inning to give the Lobos a 4-0 lead. He hit a solo shot in the fifth and gift-wrapped a tremendous performance with a two-run job in the sixth to extend UNM’s lead to 9-0. It’s another season and what appears to be another strong UNM offensive lineup. Some of you purists will refuse to call this a true no-hitter, but senior lefthander Jared Poché joined the LSU history books Saturday night with a brilliant seven-inning performance, striking out four, not allowing a walk and throwing 79 pitches, 55 for strikes. It had been quite a while since the Tigers threw a no-hitter. Before Saturday night, the last individual no-hitter in LSU history occurred on March 14, 1979. That was the program’s sixth no-hitter. A no-hitter couldn’t have happened to a better statesman for the Tigers. It looked like LSU might need to rebuild the weekend rotation outside of Alex Lange about midway through last summer. However, to the surprise of some in Baton Rouge, Poché decided to return for his senior campaign. The 6-foot-1, 217-pounder wanted an opportunity to get back to Omaha and win the the program’s seventh national title. Now, he has a no-hitter and has further etched his name in the history books. Speaking of Lange, he threw earlier in the day in a 9-0 win over Army. He struck out six, didn’t walk anyone and allowed just four hits in five shutout innings. Texas A&M enters the 2017 campaign in much the same situation as LSU was in last season. The Aggies lost a plethora of big-time hitters and leaders from last year’s super regional team, and there are question marks abound about an offense filled with plenty of fresh faces. While one must consider the competition this weekend, the Aggies couldn’t be more pleased with how their offense fared in a three-game set against Bowling Green. The Aggies did a clean sweep of the Falcons and outscored them 50-7, yes, 50-7, in the process. A&M finished off the series in impressive fashion Saturday afternoon with a pair of wins by scores of 19-2 and 16-5. In the first game, freshman Jorge Gutierrez led the offensive charge with a pair of homers, while speedy Nick Choruby hit the first home run of his career and finished the contest with two hits and two RBIs. The Aggie also got a strong performance from George Janca, who had two hits, one of them a triple. In the second game, the Aggies got more big-time performances, starting with Choruby, who had an excellent weekend at the plate. He went 3-for-4 with four runs scored and two RBIs, while Janca and Gutierrez each had triples, Walker Pennington added a pair of hits and the freshman duo of Logan Foster and Braden Shewmake each had two hits. In addition to the 50 runs they scored against the Falcons, the Aggies also smacked 46 hits. Meanwhile, in the series finale, fans got their first glimpse as sophomore righthander Mitchell Kilkenny, who missed the fall to rest his arm after a strenuous summer at the Northwoods League. The righty struck out six, walked one and allowed three runs and hits in five innings. He sat 90-93 and up to 94 with his fastball, while also sitting 84-88 with a cutter and upper-70s with the curveball. A&M will get a much stiffer test next weekend at home against Pepperdine, but its offensive output over the weekend was a surprise. Loyola Marymount is one of those programs that always seems to be on the cusp of taking a step forward. However, at least in the past, it has found ways not to take that step. Perhaps this season will be different, starting with a potential series win over UC Santa Barbara. The Lions dropped the series opener to the Gauchos on Thursday before the second game of the series was rained out. That game was played Saturday afternoon and was controlled by Lions senior lefthander Brenton Arriaga in a nail-biting 1-0 victory. Arriaga, a 6-foot-5, 215-pounder, stymied the Gauchos throughout, striking out nine, not allowing a walk and allowing just three hits in the complete game performance. He also threw 108 pitches, 71 for strikes. While the Gauchos weren’t victorious, they too received a pair of quality performances from Kyle Nelson and Steven Ledesma. Nelson struck out three and allowed just one walk, while also allowing a run on five hits in four innings. Meanwhile, Ledesma struck out four and allowed just three hits in four shutout innings. • Just another manic Saturday for Central Arkansas: So you thought the Patriots’ comeback from a 28-3 deficit in the Super Bowl was impressive? OK, it was. But Central Arkansas gets an honorable mention in the “comeback of the month” category after mounting a furious late rally against Evansville on Saturday. The Bears trailed 9-0 after five innings and 9-3 after eight frames, before rallying for six runs in the ninth to tie it up, highlighted by Michael Haun’s three-run triple. And all six runs were scored with two outs. UCA won it 10-9 on Josh Somdecerff’s walk-off homer in the 10th. • Gavin, Bryant lead Fullerton to big win: John Gavin allowed just a run on two hits over six strong innings, and Taylor Bryant homered and drove in a career-best five runs to lead Cal State Fullerton to an 8-1 win against Stanford, clinching this weekend’s only series between two ranked teams. That Fullerton pitching staff looks awfully formidable, led by stalwarts Connor Seabold, Colton Eastman and Gavin. I wrote Thursday about how Stanford’s Brett Hanewich has made major strides with his control since last year, but he couldn’t find the strike zone Saturday, allowing three runs on zero hits and three walks over 1.1 innings. • Marquee arms return strong from Tommy John surgery: On Friday, Auburn’s Keegan Thompson threw six shutout innings in his first start since having Tommy John surgery. On Saturday, two more high-profile arms shined in their starts since having TJ. South Carolina’s Wil Crowe allowed just three hits and a walk while striking out seven over five shutout innings in a 5-1 win against a very dangerous UNC Greensboro offense. Reed Scott followed with four strong innings of relief. And Virginia’s Evan Sperling yielded just an unearned run on two hits and two walks over six strong innings in a 10-6 win at The Citadel. Another big-bodied power righty like Crowe, Sperling fanned six. Worth noting: my 2017 breakout star pick, Jake McCarthy, had two more hits Saturday after going 3-for-4 with a homer, three runs and three RBIs Friday. Fellow breakout candidate Cameron Simmons notched his second straight two-hit game. If those two athletic outfielders can produce up to their talent level, and Sperling can be a dependable weekend rotation horse all season long, Virginia is going to be very, very good. • Tar Heels clinch quality series win: No. 9 North Carolina got a strong start on the mound for the second straight day, this time from Jr. RHP Jason Morgan (5.2 IP, 5 H, 1 ER, 2 BB, 5 K) and held on for a 6-5 win to secure a series win against a talented Kentucky club. UNC’s bullpen has had some adventures in the first two games, but freshman Josh Hiatt looks like a solid closer in the making, as he worked 1.1 scoreless frames to pick up the save for the second straight day. I’ve been predicting big things this spring from third baseman Kyle Datres, and he delivered two hits and three RBIs Saturday to lead the UNC offense. • Down goes the champ: Defending national champion Coastal Carolina suffered its first loss of the season Saturday, getting upset by Western Carolina 5-4. Bryan Sammons (7.1 IP, 4 H, 4 ER) earned the win for WCU, our preseason pick to win the SoCon, while electric-armed sophomore Jason Bilous struggled for Coastal, issuing five walks and allowing four runs over four innings. • Louisville out-slugs Maryland: No. 12 Louisville used a balanced 10-hit attack to beat No. 22 Maryland 10-7 in Clearwater. This game figured to be a lower-scoring affair with Taylor Bloom (3 IP, 6 H, 6 R, 3 ER) and Kade McClure (3.2 IP, 5 H, 4 ER) on the mound, but neither was sharp, and Louisville’s offense carried the day, with the help of eight walks from Maryland pitchers and five Maryland errors. The Terrapins are off to an 0-2 start after also losing Friday against Ball State, and their stay in the Top 25 will be short. • Fresno’s Thomas wins battle between Team USA lefties: Perhaps the premier pitching matchup of Week One featured two lefthanders with top-two-rounds potential and Team USA pedigrees: Oregon’s David Peterson and Fresno State’s Ricky Tyler Thomas. It didn’t turn out to be much of a duel, as Peterson was knocked around a bit (4 IP, 8 H, 5 ER), while Thomas dealt (6 IP, 2 H, 0 ER, 0 BB, 9 K). Fresno cruised to a 9-1 win. • Wolf Pack evens series: Nevada should be a contender in the Mountain West, and Sam Houston State is the team to beat in the Southland, so the series between those two clubs this weekend was sneakily compelling. After SHSU won a classic 1-0 pitcher’s duel on Friday, Nevada got a strong outing from Mark Nowaczewski (7 IP, 4 H, 2 R, 0 ER, 0 BB, 5 K) in a no-decision on Saturday. Sam Houston came from behind with two runs in the ninth to tie it, but the Pack answered with a run in the 10th on Grant Fennell’s RBI single to win it 5-4. • Wolfpack gets upset at Hawaii: It was a good day for the Wolf Pack of Nevada, but a bad day for the Wolfpack of NC State, which was toppled 8-3 at Hawaii, leveling the series. Starter Cody Beckman (3 IP, 5 H, 5 ER) struggled on the mound for NCSU, and Dominic DeMiero (7 IP, 6 H, 1 ER, 2 BB, 5 K) was strong for the Rainbows. • 49ers strike gold: There was plenty of talk in the preseason about West Virginia as a strong regional contender in the Big 12, but there was zero talk about Charlotte as a contender in Conference USA. So consider it a pretty big surprise that the 49ers came out of the gate with a pair of wins against the Mountaineers, clinching the series. Saturday’s win was emphatic, as star second baseman Brett Netzer (3-for-5, 2 R, 3 RBI) led a 15-hit barrage that included homers from Logan Sherer, T.J. Nichting and Jackson Mims, propelling the 49ers to a 13-2 blowout victory. Charlotte starter Josh Maciejewski (5.2 IP, 3 H, 1 ER) subdued a WVU offense that should be potent as the season progresses. • Beer/Krall combination lifts Clemson: First-team preseason All-American Seth Beer launched his first homer of the year, a three-run shot in the third inning, and lefty Pat Krall (6 IP, 2 H, 1 R, 0 ER, 3 BB, 6 K) shined in his season debut, as Clemson evened its series against Wright State with a 6-2 victory. • Flashes of dominance: I’m expecting Belmont’s offense to be pretty darn good this year, but the Bruins have been shut out in back-to-back games by Kent State, whose pitching looks characteristically excellent. Ace Eli Kraus threw seven shutout innings to lead the way Friday, and hard-throwing closer-turned-starter Zach Willeman (5.1 IP, 3 H, 0 R, 2 BB, 10 K) followed with a gem in Saturday’s 3-0 win. • Banuelos powers the Beach: Long Beach State bounced back from Friday’s loss at Oklahoma with an 8-3 win Saturday to even the series. Dirtbags coach Troy Buckley spoke very highly last month about catcher David Banuelos, and he backed up the praise with a three-run homer and an RBI double to lead the offense Saturday. • Musketeers take quality road series: Big East favorite Xavier split a doubleheader Saturday to clinch a nice road series against a Troy club that should be a factor in the Sun Belt. Ace Zac Lowther turned in a strong start to lead Xavier to the victory in Friday’s series opener, but Troy took the first game of Saturday’s doubleheader 2-1. Xavier bounced back with an 8-2 victory in the nightcap behind six innings of three-hit, shutout ball from Trent Astle. This should prove to be a good RPI series for Xavier down the road. • College of Charleston wins road series at Georgia: After riding a strong start from Bailey Ober and a four-hit game from Logan McRae to a 9-3 win Friday, College of Charleston secured a series win at Georgia with a 15-6 victory Saturday. Spark plug Dupree Hart had three hits and three runs atop the lineup to lead CofC’s 10-hit attack, and Georgia pitchers issued 11 walks in the ugly loss. Carter Love, who served as Charleston’s closer before getting injured last year, returned to action (earlier than CofC expected in the fall) to get the start Saturday and deliver 4.1 innings of one-run ball. If you weren’t watching the nightcap of the Texas-Rice doubleheader, you wouldn’t have seen this, but it appears one Longhorns fan started to get a wee bit loopy from all the opening weekend baseball.